35" x 24" edition: 200. 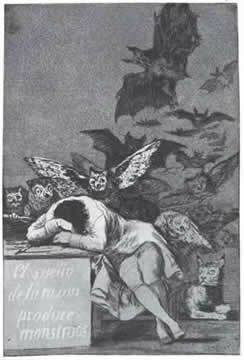 In 1986, I appropriated Goya's "The Sleep of Reason" (Los Caprichos, 1799) to make a poster for the 15th ACLU Liberty Gala. I imagined myself standing inside Goya's print, looking out at events (monsters) in 1986. 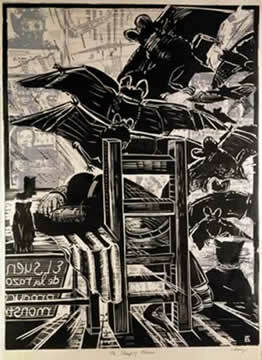 In the 1980's I worked with Amnesty International USA on refugee problems in the United States. I am the slumped figure you see from the back in my print, exhausted from struggling with the human rights abuses happening in my world. During this time, many refugees were fleeing to the US from war in Central America. I lived near one of these refugee prisons in South Texas and had first hand knowledge about effects of US policy had on refugee lives. Many refugees were fleeing for their lives. Some had evidence of having been tortured. The United States Immigration and Naturalization Service was sending these people back to Central America. Amnesty International opposes returning refugees to countries where they face torture or execution. I worked against the INS policy and helped organize a community based refugee legal aid project in Laredo, Texas. This was during the time Ronald Reagan was President. His Attorney General (also head of INS) was Ed Meese. The Border Patrol used night vision goggles, a new tool. The military establishment flourished during the eight years of the Reagan administration. An increasingly conservative Supreme Court supported States rights to ban private homosexual acts. When you look at the print starting in upper right (Ronald Reagan swimming), and look clockwise - under Reagan are White South African Lawn Bowlers, New York Times headlines about Supreme Court banning homosexual acts, abortion protest. At the bottom, in El Salvador, hands are tied together by thumbs. Moving to lower left, an El Salvador military officer. At 9 o'clock is Reagan at his desk, Ed Meese above him ( positive and negative images). In upper left is night vision goggles on Border Patrolman, then chemical weapons. In the center of the print is Nancy Reagan and Claudette Colbert playing on the beach.